Born in Ann Arbor, Michigan, Bobbie Cavnar attended Florida State University where he received a Bachelor of Science in English Education in 1999. After graduating, he taught English and Journalism for four years in the Ft. Lauderdale area before moving to North Carolina with his wife Jenny. Mr. Cavnar is currently an Advanced Placement Literature teacher and English Department Chair at South Point High School in Gaston County where he has taught for the past 13 years. In 2011 he earned a Master of Arts in English from The University of North Carolina at Charlotte, wherein his focus was English Renaissance Literature. Mr. Cavnar frequently conducts both local and state-level workshops for teachers and begins every school year by providing all beginning teachers in his district with a tour of his “Model Classroom.” Mr. Cavnar is the recipient of numerous awards for teaching excellence. He is a five-time recipient of South Point High School’s “Most Inspirational Educator Award” (which is voted on by the students of the school), and two-time recipient of his district’s award for Outstanding Contribution to the Advanced Placement Program. He is also a North Carolina State University Inspirational Teacher of the Year, South Point High School Teacher of the Year, Gaston County Schools Teacher of the Year, and the 2016 Southwest Region Teacher of the Year. On April 7th, at a ceremony in Raleigh, Mr. Cavnar was named the Burroughs Wellcome Fund North Carolina Teacher of the Year for the 2016-2017 school year. Mr. Cavnar’s platform centered around the opportunity of a free, public, and equal education offered to all Americans being not only fundamental to the success of our society but also the keeping of a historical promise made in the founding documents of our nation. Each North Carolina Teacher of the Year provides two years of service to the state and our nation. During his first year of service, Mr. Cavnar travelled the state speaking to teachers and students about educational issues. He travelled to 70 counties, attended over 100 different events, and spoke at nearly every major college of Education in the state. During both years of Mr. Cavnar’s service to the state, Mr. Cavnar sat on the State School Board as Teacher advisor and on the Governor’s Teacher Advisory Council, of which he is still a committee chair. Along with his frequent travel across the state, it was Mr. Cavnar’s role to work with a multitude of organizations including the State Legislature, The Department of Instruction, The North Carolina Association of Educators, BestNC, and The Council of Chief State School Officers, among many others. In 2017 Mr. Cavnar began his service to the nation with the other 55 state Teachers of the Year as North Carolina’s representative. In this role Mr. Cavnar traveled across the country meeting with officials and experts in order to share knowledge across state lines and to advise the Nation’s lawmakers and the Department of Education. During the summer he travelled to Germany to learn about their successes in occupational education. While there, he toured a variety of schools and factory training sites in four German States, and met with educational leaders at every level. During this year, Mr. Cavnar also travelled often to Washington D.C. to advocate and advise our nation’s leaders. He had face to face meetings with the Secretary of Education, Betsy DeVos, Vice President Mike Pence, and was able to meet with the President in the Oval office. Mr. Cavnar ended his two years of service at Space camp in Huntsville, Alabama, where he lived on campus for a week-long teacher training in STEM education. In 2017 Mr. Cavnar was awarded the NEA Foundation’s Horace Mann Award for Teaching Excellence, which is awarded to just 5 teachers in the nation for their contributions to education. As a winner of the Horace Mann, Mr. Cavnar became a finalist for the NEA Foundation’s highest honor, the Member Benefits Award for Teaching Excellence. the winner of which is given the title of “The Nation’s Top Public School Teacher.” This teacher is selected for their contributions to education, their advocacy for the profession, their community involvement, also for their actual classroom practice (which involves a lesson taught before a panel of judges in Washington D.C.). In February 2018, in front of ballroom packed with educational advocates, political leaders, and State Teachers of the Year from across the country, Mr. Cavnar was named “The Nation’s Top Public School Teacher.” In his acceptance speech, he put forth a declaration of his platform for the coming year which calls for the teaching of empathy as a skill through a renewed focus on the arts and humanities in public education. Today, Mr. Cavnar is back in his classroom at South Point High School in Belmont, North Carolina teaching Shakespeare and poetry with a focus on learning empathy through the careful study of Literature. Each day his two young daughters get off the school bus and walk to his classroom at the far end of campus where he waits to help them with their homework. Leaving from the Providence United Methodist Church lower parking lot. Lunch will be Dutch Treat at a nearby restaurant. The word 'Hindu' is derived from the river 'Sindhu' bordering the ancient Sindhu Valley of India. A long time ago, Muslims from Afghanistan, Baluchistan, and Persia could not pronounce the letter 'S' and pronounced it as a 'H.' Therefore they called the Aryan inhabitants of the Sindhu Valley 'Hindus." Membership Dues & Directory . New membership dues are $30 a calendar year that also includes the nametag. Renewal membership dues $20. 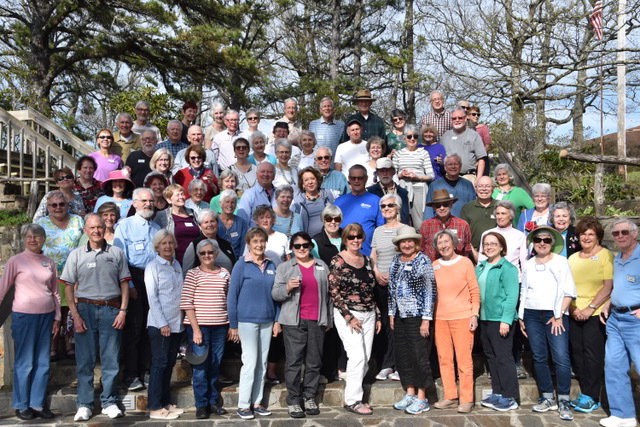 Relaxing days of learning, reflection, fellowship, laughter, entertainment, solitude, sharing and hiking at this beautiful 1,400 acre wilderness retreat near the Blue Ridge Parkway in the spectacular mountains of western North Carolina. This week’s survey covers Dr. Justin Conrad / U.S. Global Engagement and the Military Next week's survey will ask about Friday's speaker. Each week, the survey asks your opinion about the last meeting's speaker and topic. The survey opens for replies from the time it is sent until the Thursday. Results are confidential and only shared with Board members. Because I'm allergic to the print ink on most books this is the only way for me to enjoy a book. This is an option for those who missed getting a real book through Senior Scholars and are comfortable reading on a computer, phone or other device. Do not reply to this email, use sscholars@yahoo.com for all replies. http://www.seniorscholars.net/index.html for a scrolling calendar. http://www.seniorscholars.net/speakers-events.html for a list of monthly speakers.